Ecologists have always believed, at least to a certain extent, that physiological mechanisms serve to underpin ecological patterns. However, their importance has traditionally been at best underestimated and at worst ignored, with physiological variation being dismissed as either an irrelevance or as random noise/error. Spicer and Gaston make a convincing argument that the precise physiology does matter! 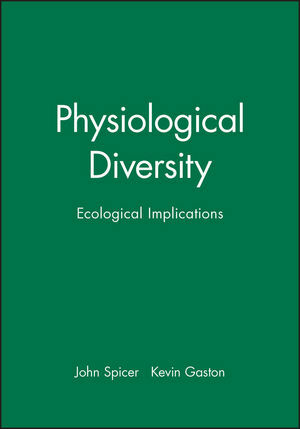 In contrast to previous works which have attempted to integrate ecology and physiology, Physiological Diversity adopts a completely different and more controversial approach in tackling the physiology first before moving on to consider the implications for ecology. This is timely given the recent and considerable interest in the mechanisms underlying ecological patterns. Indeed, many of these mechanisms are physiological. This textbook provides a contemporary summary of physiological diversity as it occurs at different hierarchical levels (individual, population, species etc. ), and the implications of such diversity for ecology and, by implication, evolution. It reviews what is known of physiological diversity and in doing so exposes the reader to all the key works in the field. It also portrays many of these studies in a completely new light, thereby serving as an agenda for, and impetus to, the future study of physiological variation. Physiological Diversity will be of relevance to senior undergraduates, postgraduates and professional researchers in the fields of ecology, ecological physiology, ecotoxicology, environmental biology and conservation. The book spans both terrestrial and marine systems. John Spicer and Kevin Gaston are the authors of Physiological Diversity: Ecological Implications, published by Wiley. 2. Growing, Developing and Ageing.